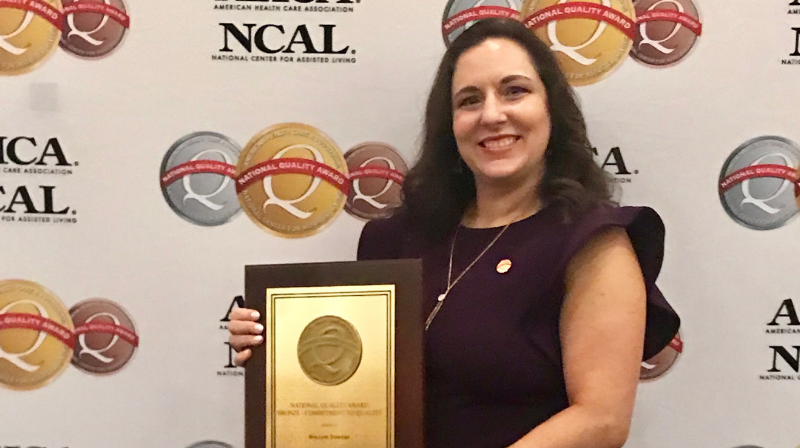 We are thrilled to announce that Willow Towers Assisted Living was recognized for its quality of care at the American Health Care Association (AHCA) and National Center for Assisted Living (NCAL) annual conference and awards ceremony, held October 7 in San Diego, California. 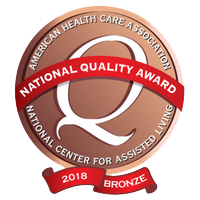 Willow Towers was the only assisted living facility in New York State to receive the Bronze Quality Award in 2018! This means that we have set the standard high for senior care in Westchester, and across the state. Led by our Executive Director, Nora O’Brien, PT, DPT, the staff in our assisted living residences (both Willow Towers and Willow Gardens, which Dr. O’Brien oversees) have been working hard to enhance the quality of life for our residents. This recognition demonstrates our commitment to providing a superior assisted living experience. The award will come as good news to families looking for senior care in Westchester County. Searching for an assisted living residence for a loved one can be challenging because such facilities are not nationally regulated. And, not all obtain the same state licensures, nor do they have the same quality standards. The AHCA/NCAL award signifies that Willow Towers is among the best assisted living communities in the nation. Created in 1996, the National Quality Award Program is centered on the core values and criteria of the Baldridge Performance Excellence Program, which helps organizations among different industry sectors achieve best-in-class levels of performance. The program has three levels: Bronze, Silver, and Gold. At the Bronze level, providers develop an organizational profile with essential performance elements such as vision, mission statement, and key strengths and challenges. Bronze applicants must also demonstrate their ability to implement a performance improvement system. Trained Examiners review each Bronze application to determine if the center has met the demands of the criteria. The Bronze Quality Award means that we are performing well against national standards. But we’re not going to rest on our laurels! Our staff is already working on achieving performance levels that meet the Silver award criteria, and ultimately, the Gold. We’re happy to say that this award is the latest honor by the United Hebrew of New Rochelle campus. We also recently received the American College of Healthcare Administrators Eli Pick Facility Leadership award (for the third year in a row); the America’s Best for Extended Care Women’s Choice Award. The official recognition from our peers counts of course—big time! But the real reward is hearing from our residents that they feel well-cared for in a community that feels like home.